I love the convenience of having lids for these versatile mixing bowls. You can mix, refrigerate, and serve from the same bowl. The lids make them stackable in the fridge, too. This handy gizmo converts a lidded pot into a steamer. It's easy to use and is dishwasher safe. I like to steam my potatoes in order to retain as many nutrients as possible. This Santoku knife is my go-to for slicing, dicing, and mincing. Cooks Illustrated gave this affordable brand of knives their #1 recommendation as a BEST BUY. 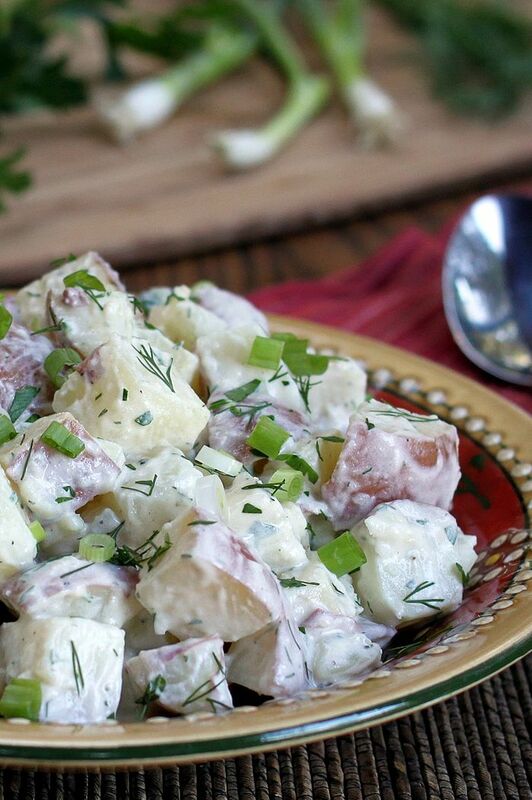 A lighter, healthy take on creamy potato salad. 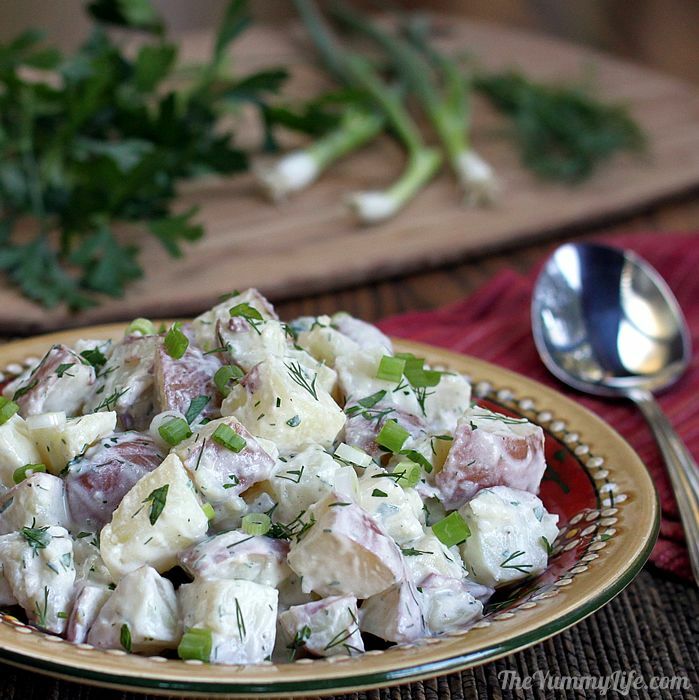 A lighter, healthy take on creamy potato salad with a flavor boost from fresh herbs. It's a crowd pleaser! 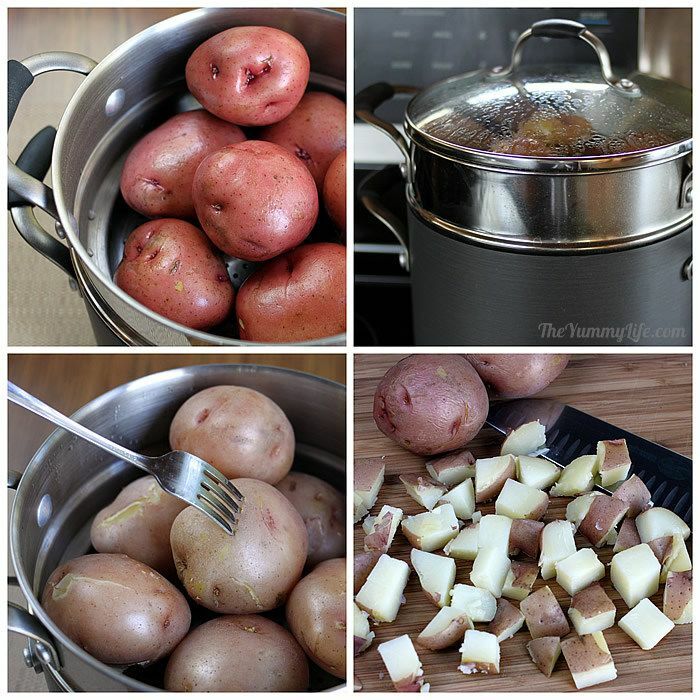 Scrub and remove any bad spots from potatoes. Leave the skin on. Steam or boil whole potatoes until fork tender in center. Let cool. Chop into 3/4" to 1" pieces. Set aside. In large bowl, combine remaining ingredients, stirring until mixed. Add potatoes and stir to combine. Cover and chill at least 4 hours. Best if chilled overnight. After the chill time, if creamier consistency is desired you may stir in milk or more yogurt a tablespoon at a time. Makes 6 cups of potato salad. This is a recipe that gets raves when I make it for picnics and cookouts. It tastes so good that no one knows it's made with healthy ingredients. They're always happily surprised when I tell them. 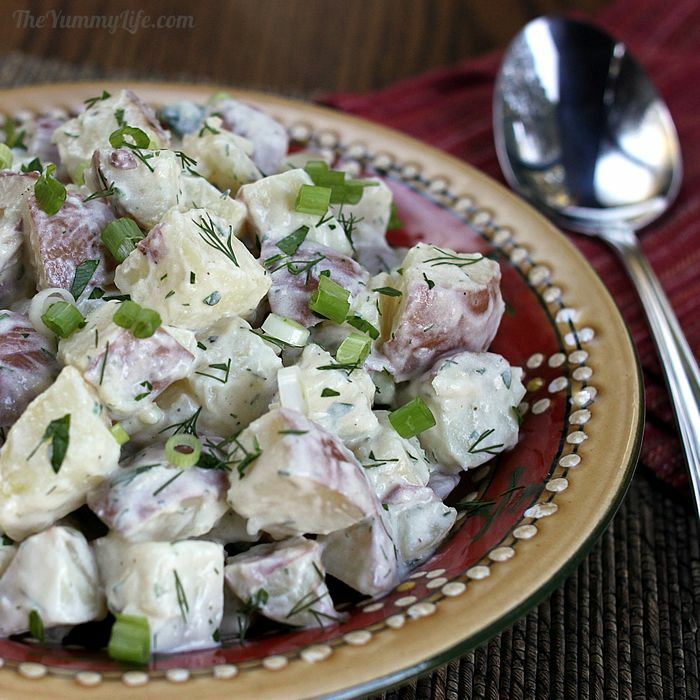 It's healthier than your average potato salad. I don't peel the potatoes, since the skin is nutrient-rich. It has B vitamins, vitamin C, iron, calcium, and potassium. 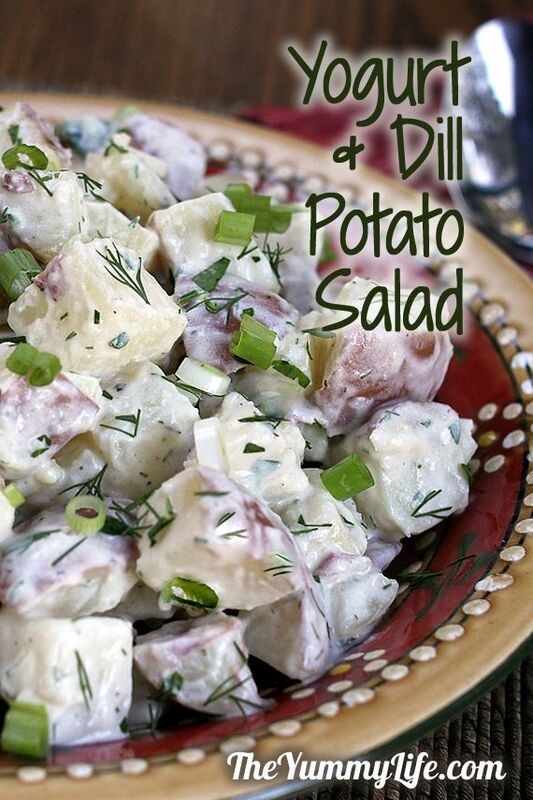 (source) The skin also provides color and texture to the potato salad. Make ahead convenience! This recipe is actually better if it's made a day ahead. I love the low-stress option of making this the day before and having it ready in advance. Red potatoes (Yukon gold's are good, too). I use organic potatoes since the skin is left on. Make sure you scrub the potatoes and remove any bad spots. Fresh dill and Italian parsley. Although fresh is better, you may substitute dried herbs. Mayonnaise. I like the flavor with just a little bit of mayonnaise added; however you can omit the mayo altogether, if you prefer. Apple cider vinegar. A touch of acid enhances the flavor of the salad. 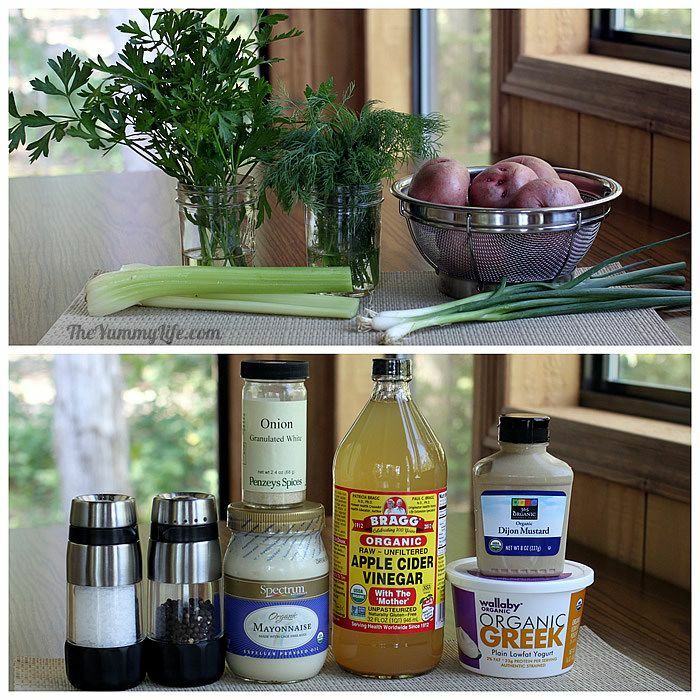 You may also use regular white vinegar or white wine vinegar. Step 2. Cook and chop the potatoes. I prefer to steam mine in order to retain as many nutrients as possible. If you don't have a steamer, you can boil them. Cook them just until they are fork tender all the way to the center. Drain the water and allow them to cool before chopping (the skins may come off if you chop them hot). I chop mine into 3/4" to 1" pieces. Step 3. 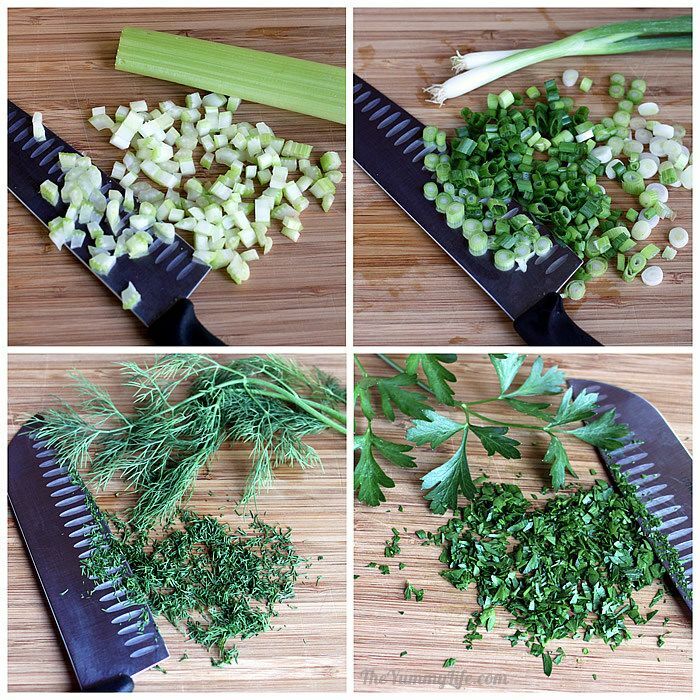 Chop the celery, onions, dill and parsley. Step 4. 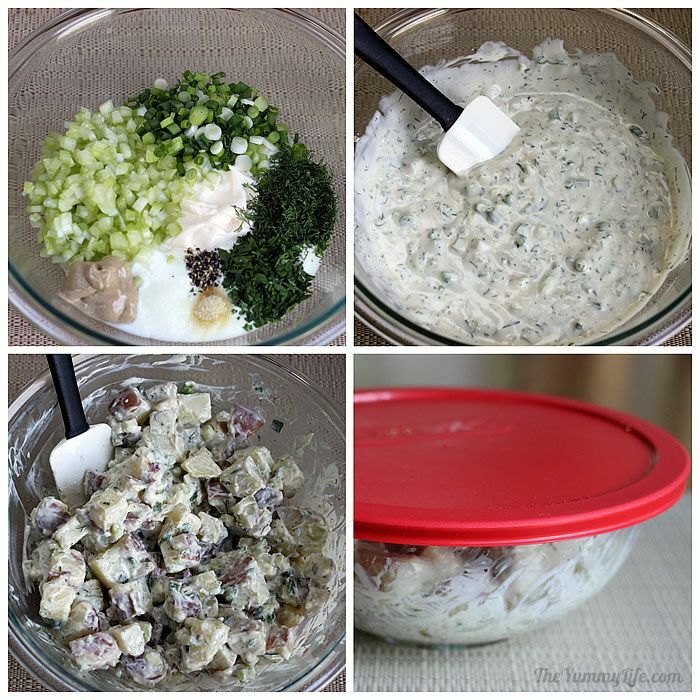 Stir the dressing ingredients together in a large bowl. Add the potatoes and stir to combine. Step 5. Cover and chill for at least 4 hours. It's even better if it's made a day ahead. An overnight hangout in the fridge allows the flavors to meld and mellow. Step 6. Garnish and serve. I like to sprinkle the top with additional fresh chopped parsley, dill and green onions, but that's optional. NOTE: If after the overnight chill time the salad isn't as creamy as you like, stir in a little milk or more yogurt. I don't usually find this necessary; it depends on the particular yogurt and potatoes you use.